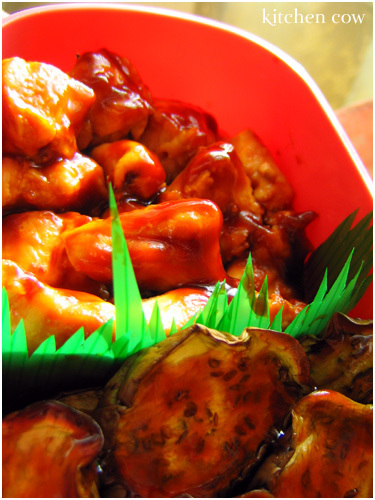 Yakitori and grilled eggplant basted with yakitori sauce. I removed the yakitori from their skewers to fit my bento box better. Rice garnished with a carrot and flat-leaf parsley flower, and quail eggs in yakitori sauce. In the Hello Kitty container is the mango pudding that never dies! More than a week in the fridge and still good, I’m down to my last 2 pudding cups. I also have a little sauce cup of milk. And of course, as additional munchies, a handful of green tea marshmallows! 1. Wash / soak the skewers in water. This is to prevent the wood from burning. 2. Cut the chicken into bite-sized chunks, with a little allowance for shrinkage. 3. Skewer the chicken and the green onions alternately. I usually put around 4-5 chunks per skewer. 4. Mix together sauce ingredients, then bring to boil. Lower heat and simmer until slightly thickened. 5. Baste the chicken with the sauce, then grill over medium heat for 5-10 minutes until cooked but not dry. Baste the chicken with the sauce while grilling for extra flavor. 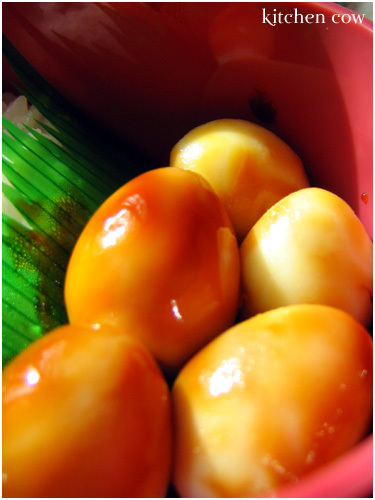 additional note: The sauce is also great with quail eggs :D, and I guess with any other vegetable or meat they serve at traditional yakitoriyas. 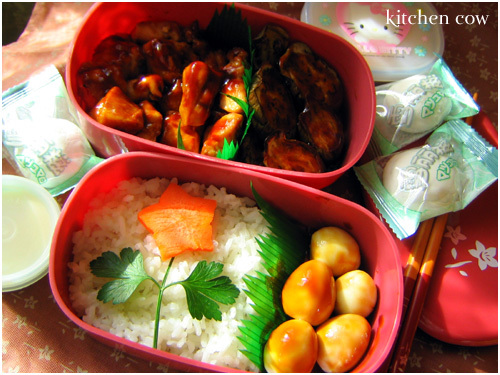 I love this foodsite, from food prep to arranging them in cute bento boxes, damn so artistic! ^_^. i wish i could have a pair of those bento boxes also. i wonder where can i bought those. Quail Eggs on a STICK!! Genius!!! !